The two wings run to the centers and try to get free. If the defender runs after the wing (left side: O2 and X2). 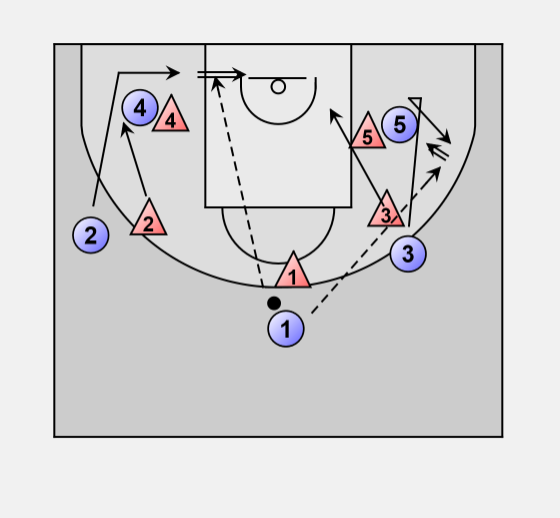 Then O2 uses the screen of 4 and cuts to the basket, defender lost easy score. If the defender does not go after the offense (right side: O3 and X3). O3 goes behind O5 and cuts to the side for a distance shot. The wings must recognize whether the defender follows them or not. If the defender follows, then a quick cut to the basket. If the defender doesn't follow cut to the outside for a middle distance shot.